What inspires me: This amazing planet and all its intricate diversity of stunningly clever life, and every kind person who fights for integrity and the underdog with courage. Best advice: If we can’t be nice we should just be quiet. 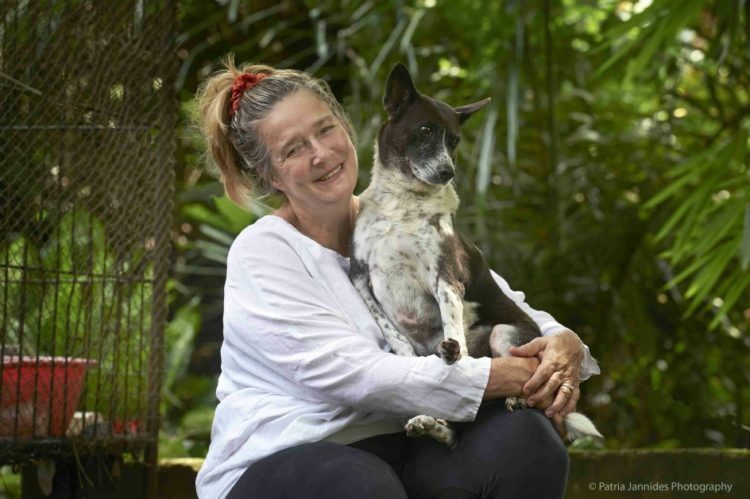 Linda Buller was on her first trip to Bali, high on the beauty of this tropical isle and miles from her painful past, when she came across what would become the first of thousands of abused street dogs. The wretched creature staggered by the side of the road, barbed-wire thin, mangy, and with its brain exposed to the air from where someone had taken to its head with the blade of a rice slasher. She couldn’t shake the image of the dog from her mind. It wasn’t just that she was a dog lover, it was that she could identify with the creatures. Abused, damaged, depressed. Like the dogs, these were labels she’d battled since childhood. Linda didn’t know it at the time, but sighting that dog would rekindle the fierce sense of justice that had stirred within her as a child – the overwhelming urge to stand up to wrongdoers. So strong did this sense of justice become that eventually Linda would go on to found Bali Dog Adoption and Rehabilitation Centre (BARC), homing hundreds of sick and dying dogs in Bali, healing them, loving them and attempting to find them new homes. 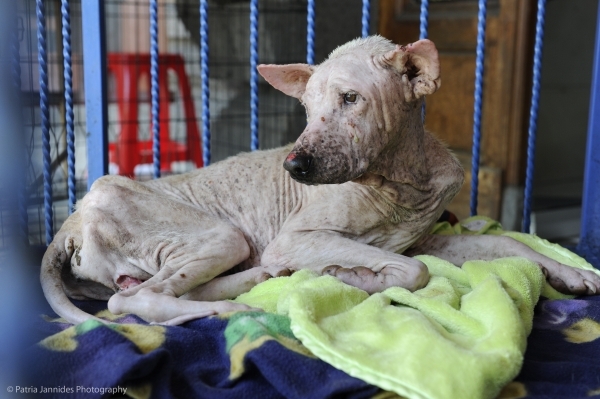 One of hundreds of neglected and abused Bali street dogs. The urge to fight for the underdog began early. As a kid Linda remembers chasing down boys who had done the wrong thing and berating them. Someone had punched her cousin. A seven-year-old Linda beat him with her umbrella. Some had started a fire and stolen some jewellery. A seven-year-old Linda chased him down and beat him in a fury of small fists. She’d fight her own stepfather too. She says he’d creep into her room, even when her smaller sister lay sleeping on the bottom bunk, to try and sexually and physically abuse her. One day, as a teenager, Linda braced herself against the bunk’s strong wooden uprights. “I held onto the both beams and rolled backward using my legs as a spring and when the door opened I let him have it, both feet shot out into his midriff and down he went,” Linda says. While this only served to further enrage her stepfather, she was determined to stand up to him. She was terrified that submitting to him would rob her of what remained of her spirit. Without her spirit, she’d be crushed. Without her spirit, she’d be crushed. The trauma of Linda’s childhood would spark an adulthood of ongoing crises. An abortion at 16. An attempted overdose at 20. Married by 20. A mother by 20. A heavy drinker by 22, institutionalised in a mental home by 23, divorced at 24. By 30 Linda had remarried and again fallen pregnant. She gave birth to a premature girl, Francesca. The tiny child died within hours of her birth. The trauma of Linda’s childhood would spark an adulthood of ongoing crises. Unable to cope with the grief that swamped her after her daughter’s death, Linda left her husband and, after winning a contract to paint a mural, she spent her new pay check on a month-long escape to Bali. Removed from the scenes of her haunted past, the fierce fighting spirit that had saved her as child resurfaced. Maybe, just maybe, she could turn her life around. Maybe, she had the chance to refuse to be defined by her past. Linda also met a Balinese man whom she’d go on to marry. Back in Australia, she set up a mobile massage service in Melbourne which became so popular she trained up her own team of staff and they’d massage VIP guests in swanky resorts. “There was no hanky panky,” Linda says. “We all had uniforms, we were professional, we used good quality essential oils and had a respected reputation.” During these few years Linda also enrolled in university and also studied traditional Chinese Medicine. In 1990 she received her Diploma of Traditional Chinese Medicine. While on the surface Linda’s life seemed more positive than ever before, she couldn’t contain the mental anguish of her childhood. She again divorced. Her drinking intensified. She let the business fall apart. Then her son, by then 17 years old, become addicted to drugs. She couldn’t contain the mental anguish of her childhood. Back in Bali, Linda would take abused dogs in as her own, try to heal them, take them to the vets. But it wasn’t long before she came to appreciate the enormity of the problem. Many Balinese liken street dogs to vermin infesting their streets. They believe the dogs’ poor actions in a past life mean they deserve the life they endure today. Linda says recently such people have attempted to kill stray dogs by beating or stabbing them. Often they succeed, but often their attempts leave the animals alive, though hideously wounded. She says officials also conduct their own ‘clean-ups’, leaving some dogs to die agonising deaths from poisoning, and resulting in piles of dog bodies left in the streets. A vet helps a BARC dog. As Linda began to take in more and more dogs, she realised the need for a more formal operation. She launched Bali Dog Adoption and Rehabilitation Centre (BARC) as a no-kill shelter in 2006 to provide vaccination, education, sterilisation and medical help to rescued animals. Today BARC also operates a street sterilisation program to help stop the relentless flow of unwanted puppies. 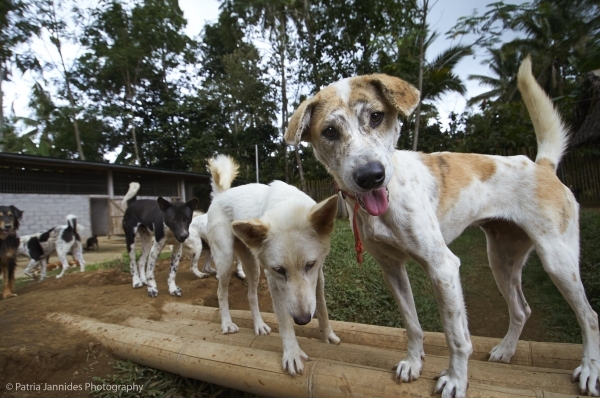 And it conducts education programs in the Balinese community to help shift attitudes towards the indigenous Bali street dogs. As the centre grew, Linda opened a basic clinic in central Ubud where the non-emergency cases were treated and receive care, as well as an adoption centre and retail outlet, from which all profits go directly to the care of the animals. BARC also operates a sanctuary known as ‘Warrior’s Legacy’ in the mountains, which is home to 60 adult dogs, as well as rescue horses, pigs and monkeys. Dogs at the BARC refuge. With BARC now operating for 11 years, and Linda at 65 years of age, Linda is exhausted. Yet she remains driven to rescue the dogs with which she so closely identifies. Linda is constantly awed by dogs’ ability to love, despite the abuse they have endured.